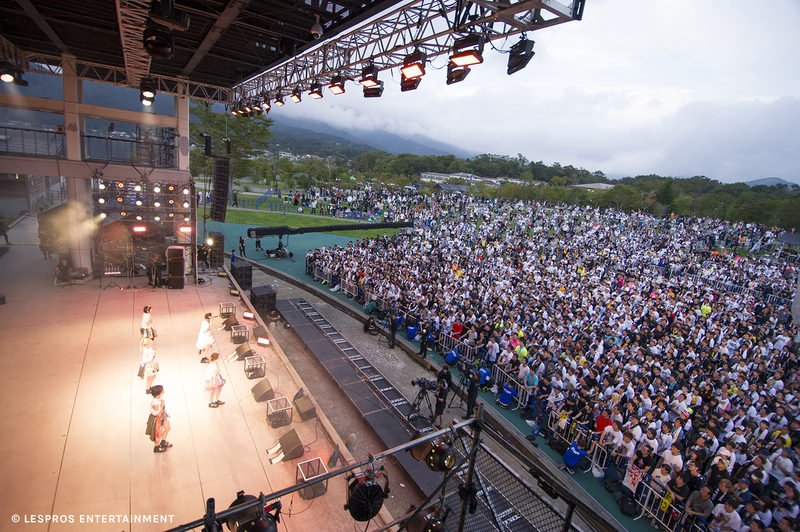 The beautiful stage of Yamanakako Plaza Kirara welcomed this week-end Babyraids JAPAN for their final live, “Hear the Tiger roar! Climax of the Legendary Thunder Dance”, putting an end to six years of idol activities for the group. Babyraids JAPAN waved 4000 fans goodbye in a striking 5-hours long performance, living up to this concert’s epic title. 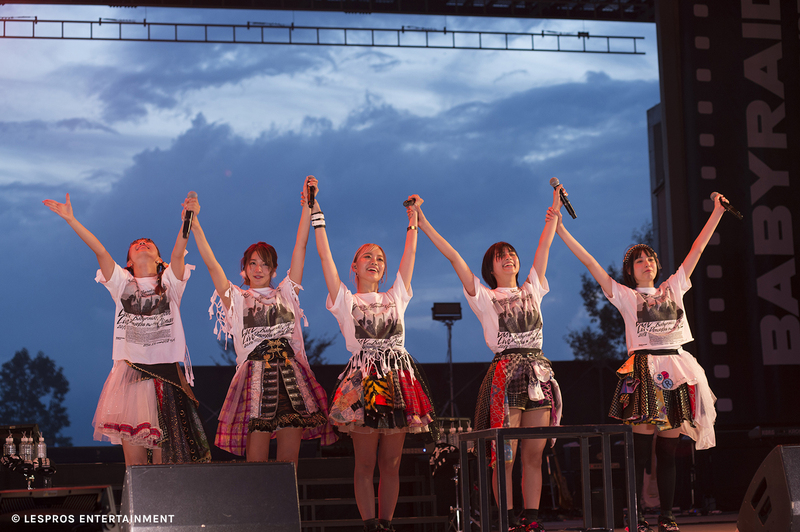 The five members of Babyraids JAPAN debuted in May 2012 and gave their final performance all together this week-end. Their break-up had previously been announced in July 2018, after a six-years long career. 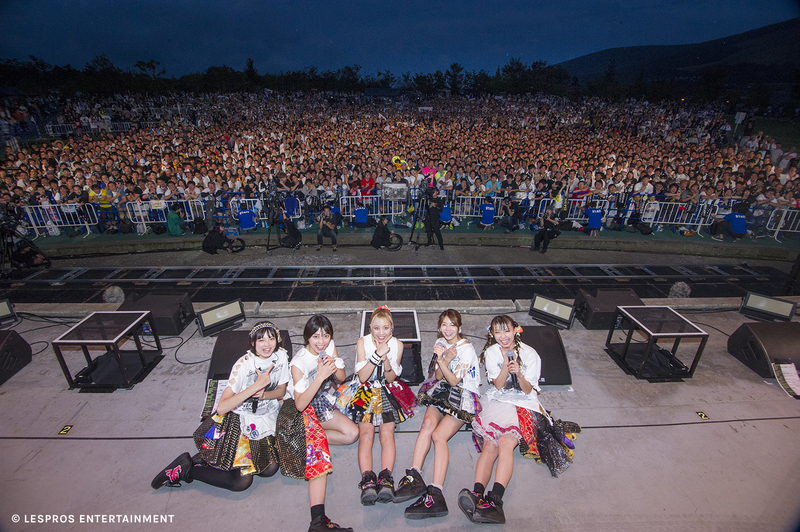 “We wanted our fans to have the most beautiful view we could give them for this last live, in front of Mount Fuji, the highest spot of Japan,” the group explained, justifying their fans coming all the way to Yamanakako Plaza Kirara. The open-air stage has a window allowing the audience to admire the world-famous Japanese mountain throughout the entire show. All their fans gathered under the blue sky to celebrate this final Babyraids JAPAN performance. A round of applause and cheerful calls from the audience rose as the members appeared on stage after an introduction video. The show started in a bright mood with their lead vocalist, Hayashi Manatsu, telling the Tigers (the Babyraids JAPAN fans) to roar loud, before singing “Gate of the Tiger”. The entire audience then clapped their hands along the rhythm of “Pretty Little Baby”. “Ride on IDOROCK” was a medley made of five solo songs, letting each one of the members show their own personality to their fans. 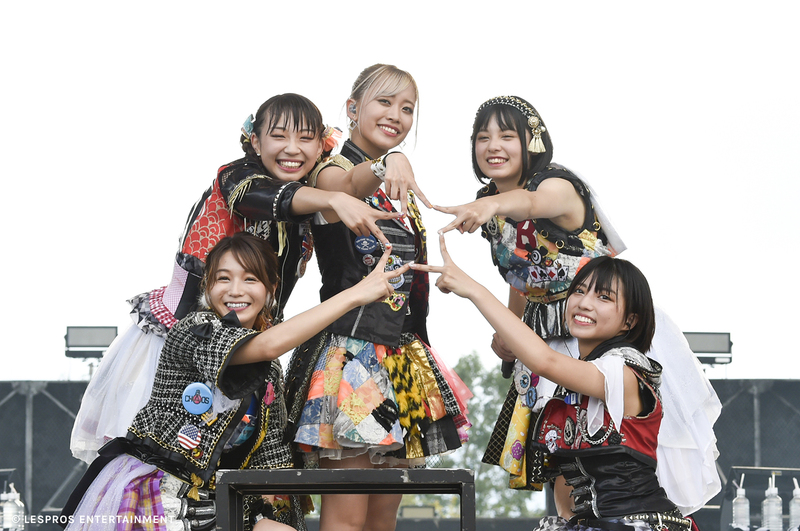 While the group started singing the first lines of “Baby Kiss”, Denya Erika, the group’s leader, threw a call to their audience. “Thank you for loving us throughout these six years! I will always love you!” she said from the bottom of her heart. The five idols then brought out folding fans they had created themselves to boost the mood for the energetic “Nippon Chu!Chu!Chu!”. The five members had not taken any break since the beginning of the show. 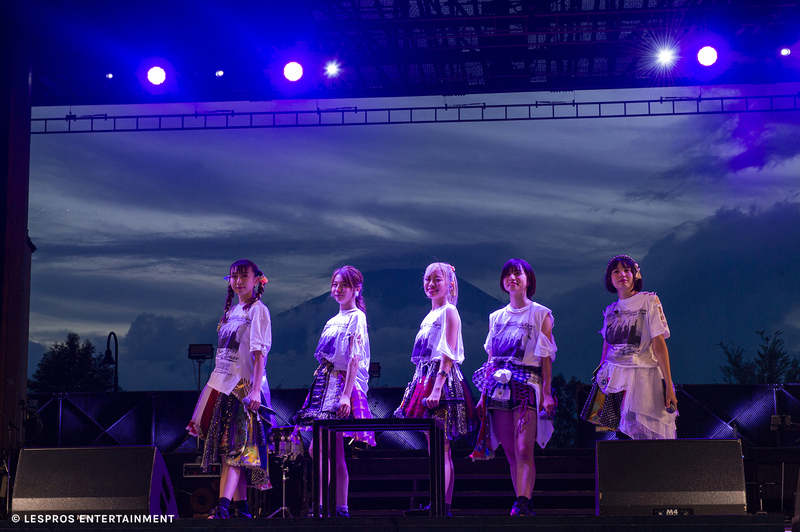 Hayashi Manatsu took a moment to express her feelings: “Seeing all these people who came here for us, it’s an indescriptible feeling.” Takami Nao, usually known for bringing rainy weather with her, was surprised that the sky was so clear for this final performance. “I don’t think I have seen such beautiful weather ever in my life,” she joked. The group moved to a secondary and smaller stage in the middle of the audience for “Sekai wa Chachacha!”. Wearing red and white snapback caps, they gave their usual very best. They all went back to the main stage on a couple of sweet ballads like “Baby Step” and “Supernova”, to then started dancing fiercely on the rock sounds of “Baki Baki”. The powerful and sharp performance of Babyraids JAPAN resonated throughout the entire valley, giving emotional chills to the audience. The second part of the show opened on the chorus of Babyraids JAPAN’s anthem, “Yoake Brand New Days”. Backed up by musicians on stage, the five members took position, wrapped in printed cloaks, starting with their very first single track “Eikou Sunrise”. While the first chimes of “Antihero” resonated, all five idols took their cloaks off to reveal their brand new outfits, created combining elements of all their previous stage costumes throughout these six years. “Let’s reach the top!” screamed Hayashi Manatsu, while the group sang “Hashire, hashire”, then “Atarashii Sekai”. Waving a flag sporting the group’s logo, the group headed towards the secondary stage in the middle of the crowd, blowing some fresh air on their fans with “Tora Tora Tiger”, then dancing with them on “Bucchake Rock’n Hacchake Roll”. Babyraids JAPAN then went back to the main stage for “Namida Nochi Hare” and “Bokura no Real”, raising their fists for “Nando demo”. The members could not resist the tears when Oya Rikako‘s voice broke on “Dreamer”. “Thank you for all the love you gave us until today,” said Denya Erika, welcomed by a round of applause. While the sun slowly sets, the end gets near. Oya Rikako then talked to their audience: “I will enjoy this moment by watching every single of your faces ! Raise your fist the highest possible”, she said, not allowing their fans to feel any speck of regrets and making the atmosphere even more electrified. The rock waves rolled from the stage to the crowd, with “Baby Revolution”, “Senkou Believer”, “○○○○○” and “Cinderella jya irarenai”, the fans cheering for their idols in a big united call. After performing their very first track, “Babyraids”, until “Yoake Brand New Days”, this soul-burning show came to an end with the very last song. “Rikopin, Denchan, Takami, Rioton, thank you for everything,” said Hayashi Manatsu to her comrades, while “Bokura wa koko ni iru” started in a tempest of emotions. Amidst the tears, we finally reached the climax of this legendary show. Coming back after a round of never-ending applause resonating in the valley, Babyraids JAPAN then sang “Spiral” in a whirlpool of grateful feelings towards their fans. As if it had been summoned by the voices of the five idols, we could finally enjoy the view of Mount Fuji, revealing itself behind the clouds. All members then took the microphone one by one to talk to their fans one last time. “Babyraids’ Debut Song”: here was the theme for this double encore for the show. The members came back on stage wrapped in their cloaks, that had been given to them as a gift from their fans, printed with pictures retracing six years of cherished memories. The last chorus started. Denya Erika then yelled “Thank you for these six years of love and precious moments!”, and the five members of Babyraids JAPAN bowed deeply in front of their audience, to leave the stage holding each other by the shoulder. The stage monitor screen was then turned on to reveal the music video for a new version of anthem “Yoake Brand New Days”, rearranged to become “Yoake Brand New Days（farewell and beginning)”. 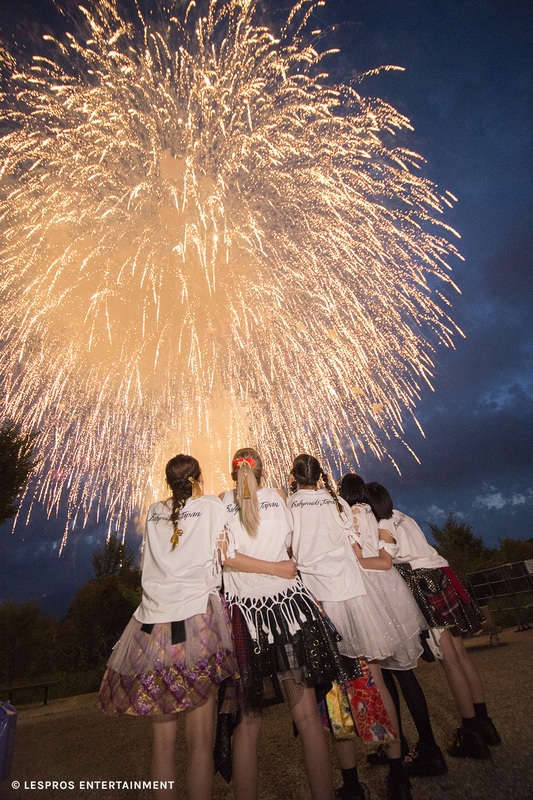 It was in front of wonderful fireworks, organized by the fans for their idols, that this night ended, blessing the five members of the group in their future endeavours. Babyraids JAPAN’s last live, “Hear the Tiger roar! Climax of the Legendary Thunder Dance” (全虎が啼いた！伝説の最高雷舞（クライマックス）) will be released on Blu-ray at the end of the year. With not less than two disks for the main concert, it is on a third extra disk that the fans will be able to see their idols again in a documentary, “The Documentary of Babyraids Japan”. The music video for “Yoake Brand New Days（farewell and beginning)” was revealed on September 25th on Youtube, and this last single will be released on the next day as a limited edition. Special thanks to Lespros Entertainment for allowing us to translate and publish this press release.